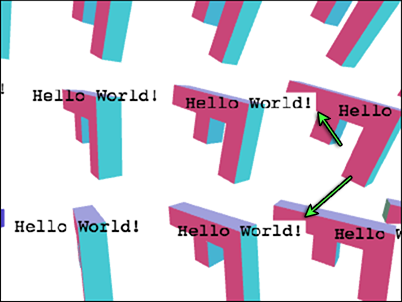 This post is a continuation of many articles about WebGL. The last one was about using Canvas 2D for rendering text over a WebGL canvas. If you haven't read it you might want to check that out before continuing. In the last article we went over how to use a 2D canvas to draw text over your WebGL scene. That technique works and is easy to do but it has a limitation that the text can not be obscured by other 3d objects. To do that we actually need to draw the text in WebGL. The simplest way to do that is to make textures with text in them. 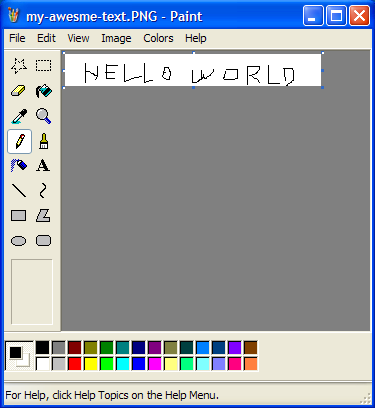 You could for example go into Photoshop or some other paint program and draw an image with some text in it. Then make some plane geometry and display it. This is actually how some games I've worked on did all their text. For example Locoroco only had about 270 strings. It was localized into 17 languages. We had an Excel sheet with all the languages and a script that would launch Photoshop and generate a texture, one for each message in each language. Of course you can also generate the textures at runtime. Since WebGL is in the browser again we can rely on the Canvas 2D API to help generate our textures. // Puts text in center of canvas. Now that we need to draw 2 different things in WebGL, the 'F' and our text, I'm going to switch over to using some helper functions as described in a previous article. If it's not clear what programInfo, bufferInfo, etc are see that article. So, let's create the 'F' and a unit quad. Then finally we we multiply in the projectionMatrix when setting our uniform value. It's important to note here that projectionMatrix is on the left. This lets us multiply in the projectionMatrix as though it was the first matrix. Normally we multiply on the right. For the text we start with the projectionMatrix and then get only the position from the fViewMatrix we saved before. This will get us a space in front the view. We also need to scale our unit quad to match the dimensions of the texture. // scale the F to the size we need it. // setup to draw the text. You'll notice that sometimes parts of our text cover up parts of our Fs. That's because we're drawing a quad. The default color of the canvas is transparent black (0,0,0,0) and we're drawing that color in the quad. We could instead blend our pixels. This makes it take the source pixel (the color from our fragment shader) and combine it with the dest pixel (the color in the canvas) according to the blend function. We've set the blend function to SRC_ALPHA for source and ONE_MINUS_SRC_ALPHA for dest. Here's the result with blending enabled. What's happening? We're currently drawing an F then its text, then the next F then its text repeated. We still have a depth buffer so when we draw the text for an F, even though blending made some pixels stay the background color the depth buffer was still updated. When we draw the next F if parts of that F are behind those pixels from some previously drawn text they won't be drawn. We've just run into one of the most difficult issues of rendering 3D on a GPU. Transparency has issues. The most common solution for pretty much all transparent rendering is to draw all the opaque stuff first, then after, draw all the transparent stuff sorted by z distance with the depth buffer testing on but depth buffer updating off. Let's first separate drawing of the opaque stuff (the Fs) from the transparent stuff (the text). First we'll declare something to remember the text positions. For drawing the text we'll turn on blending and turn off writing to the depth buffer. Notice we didn't sort like I mentioned above. In this case since we're drawing mostly opaque text there's probably going to be no noticable difference if we sort so I'll save that for some other article. Another issue is the text is intersecting its own 'F'. There really isn't a specific solution for that. If you were making an MMO and wanted the text of each player to always appear you might try to make the text appear above the head. Just translate it +Y some number of units, enough to make sure it was always above the player. You can also move it forward toward the cameara. Let's do that here just for the hell of it. Because 'pos' is in view space that means it's relative to the eye (which is at 0,0,0 in view space). So if we normalize it we get a unit vector pointing from the eye to that point which we can then multiply by some amount to move the text a specific number of units toward or away from the eye. You still might notice an issue with the edges of the letters. The issue here is the Canvas 2D API produces only premultiplied alpha values. When we upload the contents of the canvas to a texture WebGL tries to unpremultiply the values but it can't do this perfectly because premultiplied alpha is lossy. This tells WebGL to supply premultiplied alpha values to gl.texImage2D and gl.texSubImage2D. If the data passed to gl.texImage2D is already premultiplied as it is for Canvas 2D data then WebGL can just pass it through. The old one multiplied the src color by its alpha. That's what SRC_ALPHA means. But now our texture's data has already been multiplied by its alpha. That's what premultiplied means. So we don't need the GPU to do the multiplication. Setting it to ONE means multiply by 1. The edges are gone now. What if you want to keep the text a fixed size but still sort correctly? Well, if you remember from the perspective article our perspective matrix is going to scale our object by -Z to make it get smaller in the distance. So, we can just scale by -Z times some desired-scale to compensate. If you want to draw different text at each F you should make a new texture for each F and just update the text uniforms for that F.
We've been using black to draw the text into the canvas. It would be more useful if we rendered the text in white. Then we could multiply the text by a color and make it any color we want. This technique is actually the technique most browsers use when they are GPU accelerated. They generate textures with your HTML content and all the various styles you've applied and as long as that content doesn't change they can just render the texture again when you scroll etc.. Of course if you're updating things all the time then this techinque might get a little bit slow because re-generating the textures and re-uploading them to the GPU is a relatively slow operation. In the next article we'll go over a techinque that is probably better for cases where things update often. You might notice in the examples before we started using a consistent size the text gets very pixelated as it gets close to the camera. How do we fix that? Well, honestly it's not very common to scale 2D text in 3D. Look at most games or 3D editors and you'll see the text is almost always one consistent size regardless of how far or close to the camera it is. In fact often that text might be drawn in 2D instead of 3D so that even if someone or something is behind something else like a teammate behind a wall you can still read the text. Make different sizes of textures with fonts at different resolutions. You then use the higher resolution textures as the text gets larger. This is called LODing (using different Levels of Detail). Another would be to render the textures with the exact correct size of text every frame. That would likely be really slow. Yet another would be to make 2D text out of geometry. In other words instead of drawing text into a texture make text from lots and lots of triangles. That works but it has other issues in that small text will not render well and large text you'll start to see the triangles. One more is to use very special shaders that render curves. That's very cool but way beyond what I can explain here.